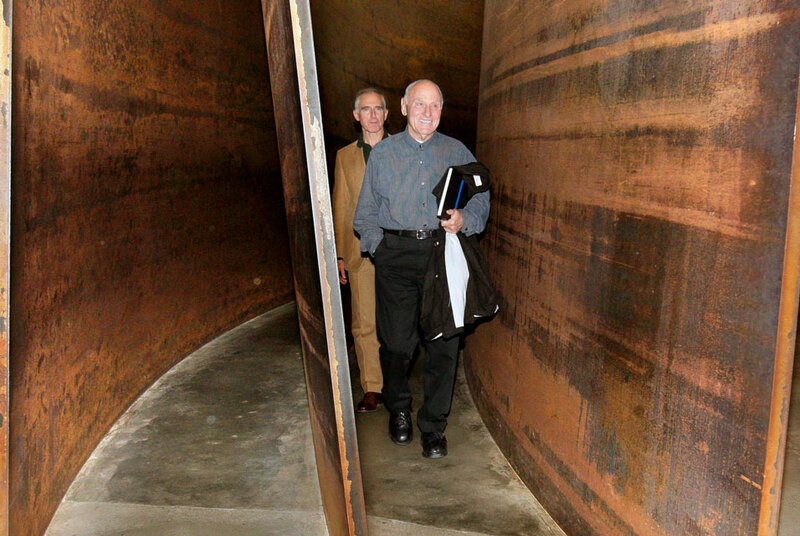 File photo of US sculptor Richard Serra (Front), winner of Prince of Asturias Prize 2010 for the Arts during 2010, visits the Guggenheim Museum in Bilbao with its director, Spanish Juan Ignacio Vidarte in Bilbao. EPA/ALFREDO ALDAI. DOHA.- Qatar Museums Authority (QMA) announced today that it will open MIA park, a new cultural destination on Dohas Corniche, on December 16, 2011. Located on the grounds of the world-renowned Museum of Islamic Art, the nearly 280,000-square-meter (68-acre), crescent-shaped park is designed by Pei Partnership Architects of New York and will feature a vertical steel sculpture by internationally acclaimed American artist Richard Serra. The as-yet-untitled sculpture is Richard Serras first public artwork in the Middle East. Details of the MIA parks grand opening and related public events will be announced at a later date. It is my hope that the sculpture will provide both a public place and a private space for people to gather and experience the narrow, vertical, open column in relation to themselves, the Museum of Islamic Art, the city of Doha, the surrounding sea, and the sky as seen through the opening at the top of the sculpture, said Richard Serra. MIA park will include five kilometers (more than three miles) of lighted pedestrian pathways shaded by native palm trees. Visitors will also find paddle boats for rent in a small cove in Doha Bay, as well as a café and kiosks offering refreshments. Year-round public activities at MIA park will include film screenings, sports events, storytelling programs and art workshops. MIA park will be developed in phases, with additional elements and amenities to be announced in the future.